Have you ever heard of a Muggin, Goldmation or a Snorkie? Sometimes, you can tell by the name which dog breeds where mixed together to create the new dog breed. For example, Labradoodle is a mix between a Labrador Retriever and a Poodle. Those are all examples of 2 different dog breeds that have been bred together. The hybrid mix results in a new dog breed name. What Should I Call My Dog’s Breed? If you’re reading this article, then chances are you recently adopted a dog whose parents were 2 different breeds and you’re wondering what to call that new dog breed. Or, perhaps your own dog is pregnant with mixed breed pups, and you’re wondering what breed to call the puppies when they are born. Check out this list of over 300 new dog breed names from the American Canine Hybrid Club. 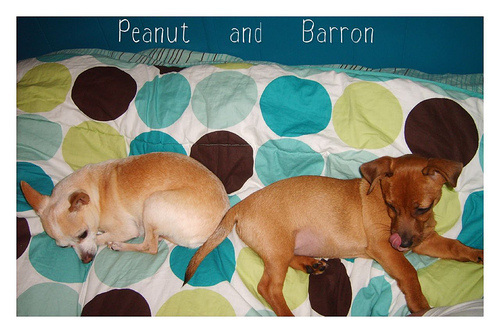 The best part about most of the new dog breed names out there is they’re really fun to say. Talk about a conversation starter! NOTE: If a name for your mixed breed dog doesn’t appear on the lists above, then your mixed breed dog might be an entirely new dog breed! If so, share the 2 breeds in the Comments below and someone else might be able to help you determine the best new dog breed name.